this weekend i was one of the key-note speakers for the carolina bloggin meet-up held in columbia, sc. i had an amazing time with all of the bloggers. i was definitely honored they asked me to present. this is what i wore. if you are new to the blog mixology monday is where i take my liberty and display a fit i recently wore. most of the fits are a mix of high end and thrifted pieces. its true that i am very thrifty, but i also purchase signature pieces whenever i have an opportunity to do so. 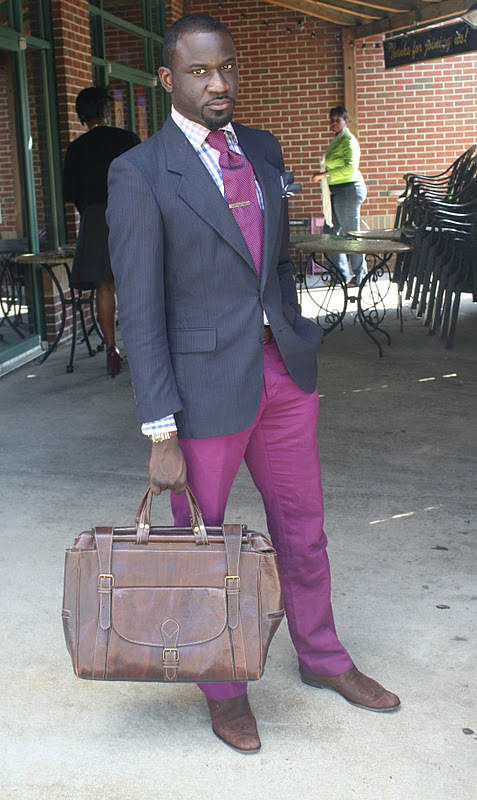 there are a number of fashion blogs dedicated to men's style. when i grow up...i want to be a fashion blogger. most of the photos that are of me, on my blog i take them myself. i don't have the luxury of having a street style photographer. so, i appreciate chip for taking these photos. thrifted jacket, thrifted burberry tie, vintage tie bar, nautica shirt, incotex pants, billy ried buffalo loafers, fossil watch, thrifted carrying case.